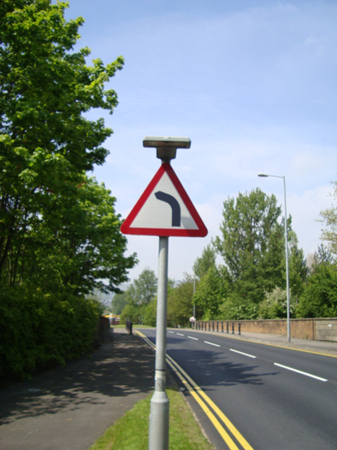 At Standard Signs we manufacture CE marked permanent signs in line with “The Traffic Signs Regulations and General Directions 2002” and BS EN 12899-1:2007. We offer a complete service from design through manufacture to installation. Please call to discuss your particular requirements. 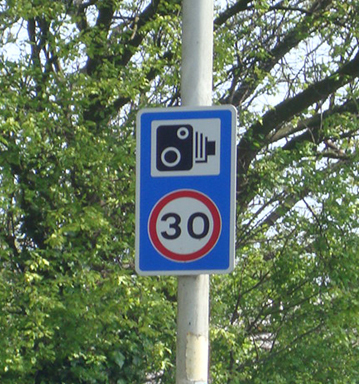 Standard Signs were early adopters in the use of microprismatic retroreflective sheeting and the majority of our Class RA2 signs are made with 3M High Intensity Prismatic (HIP) sheeting allowing us to give a 12 year warranty on our permanent road signs. HIP carries the CE quality marking as your guarantee that it meets all the performance criteria required by BS EN 12899-1:2007 and BS 8408:2005. However, that's only part of the story. When compared with other class RA2 materials, HIP is clearly superior. The reflectivity, colour contrast, legibility, brightness and durability of HIP are all much better than can be achieved with glass beaded materials. The production techniques used for HIP are also much kinder on the environment than other reflective sheeting manufacturing methods. Volatile Organic Compound (VOC) emissions are reduced by 97%, energy consumption by 77% and solid waste by 46% when compared to glass beaded sheeting manufacture. Several of our customers now specify the top of the range Diamond Grade (DG3) reflective sheeting. Designed for durable road traffic signs, including gantries, motorways and trunk road signs, DG3 is certified in European Technical Approval (07/0272) and is the only premium sheeting that carries the CE quality marking. DG3 is available in five colours, and also in fluorescent and translucent formats for special applications. In all formats, DG3 achieves its remarkable performance from the use of full corner cube optics which reflect more light back to the driver than any other reflective system. 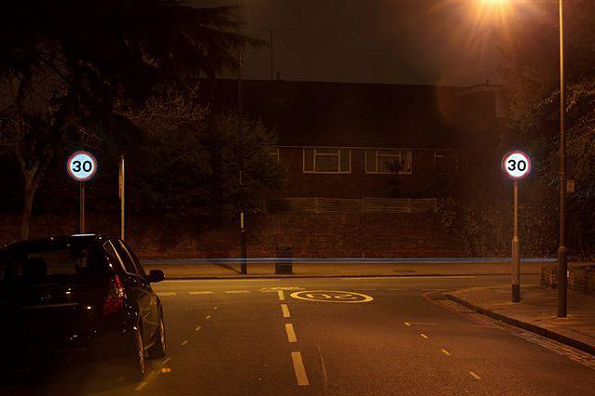 We also supply a range of external illumination and are happy to discuss your individual requirements. Enhance your town’s image with our Cast Aluminium Worcester System. Anti-rotation device on outreach sign. Variety of styles to meet local environments. Versatile multi-direction and multi- stack system. 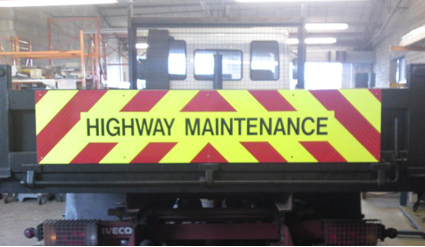 Chapter 8 part 2 section O5.2.3 requires that on high-speed roads (50 mph+), all vehicles stopping on the highway for purposes of works or inspections shall be equipped with high visibility rear markings. It also requires or allows for other markings too, for example, to the sides of long vehicles that are used in temporary traffic management situations. Permitted markings include chevrons comprising alternate strips of fluorescent orange-red retroreflective material and fluorescent yellow non-retroreflective material. Each strip of the chevron must be not less than 150 mm in width, inclined at 45-60° to the horizontal and pointing upwards. An alternative to chevrons is a solid block of fluorescent orange-red retroreflective material. Red retroreflective tape must also be applied to all rear facing edges of open doors, guardrails and equipment lockers, and to the face of any device that obscures the markings and is displayed to the rear. The reflective markings must be 'Class RA2' or 'microprismatic' (e.g. 3M™ Diamond Grade™ DG³ reflective sheeting) in the case of rear markings and 'high visibility fluorescent or non-fluorescent yellow reflective' in the case of side markings. 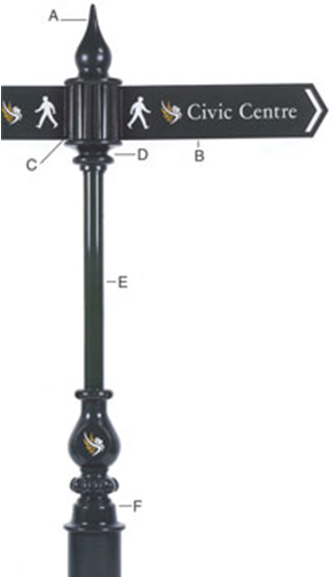 Standard Signs supply chevrons in kit form and also offer an application service at our factory. Please contact us to discuss your exact requirements and we will be pleased to help. From July 2011, all newly registered HGVs over 7.5 tonnes and trailers over 3.5 tonnes must have reflective markings that clearly outline the rear and sides of the vehicle to make it visible for up to 1000 metres at night. ECE104 specifies the standard for the reflective materials used, and where and how it must be positioned on the vehicle or trailer. Standard Signs provide kits, rolls or an installation service. Please call for advice. These signs are usually Class RA2 manufactured with 3M Temporary HIP reflective material on your choice of Aluminium or Dibond substrates. They can be supplied as "plate only" or drilled to suit Quickfit frames. 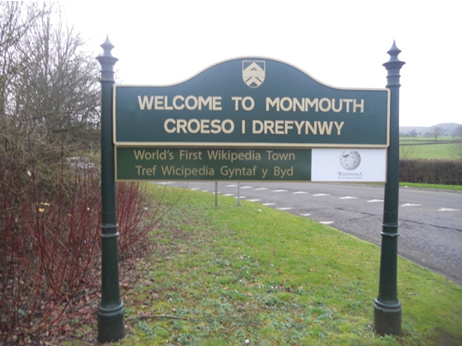 Examples of some common signs can be seen below, but please contact us to discuss your exact requirements. 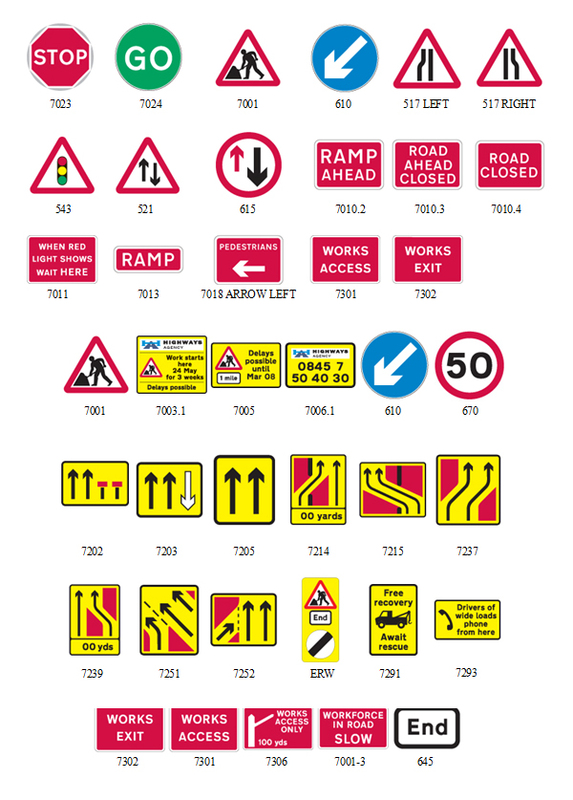 Standard Signs manufacture the full range of temporary signs to Chapter 8 of the Traffic Signs Manual which are usually class RA1 on Zintec. These can be supplied as "plate only" or in angle frames (clipped or riveted). 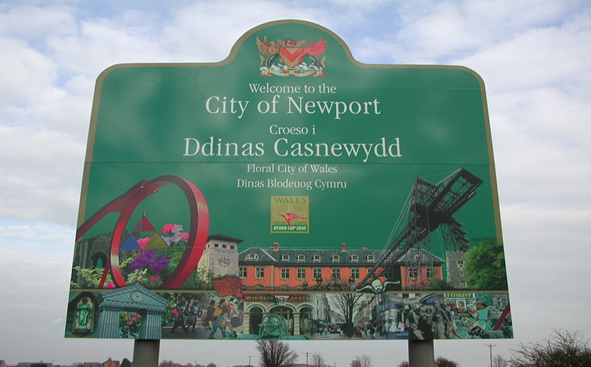 Examples of some common signs can be seen below, but please contact us to discuss your exact requirements.